How could a structured proposal for an evaluation rubric benefit from assessing and including the organizational variables used when one of the first definitions of gamification related to game theory was established by Thomas W. Malone in 1980? By studying the importance and current validity of Malone’s corollaries on his article What makes things fun to Learn? this work covers all different characteristics of the concepts once used to define the term “gamification.” Based on the results of this analysis, we will propose different evaluation concepts that will be assessed and included in a qualitative proposal for an evaluation rubric, with the ultimate goal of including a holistic approach to all different aspects related to evaluation for active methodologies in a secondary education environment. Gamification (for many students and even for their teachers) seems to be a very enjoyable learning method, since it consists of playing and having fun while learning, so it is a facet of learning encouraged by all levels of the educational system. The gamification model has been used for a long time by various companies, according to the website Wonnova , which applies this model to the movie Jumanji. The corporate idea of gamification has been used to motivate workers and customers to perform certain actions, for example, to define certain objectives with a motivational goal, to design a plan, to create game mechanics within the business environment, to develop a sense of belonging, or to design a company’s motto. From an educational point of view, gamification is not a new strategy, as game concepts have been used to motivate, stimulate, and impart content ever since the schooling system’s early times. The use of these game elements will not only be performed during the early childhood educational stages, as these playful experiences can be enjoyed regardless of age and whether or not it is clear that present educational elements are embedded on these strategies. Another aspect that should not be forgotten within this educational aspect of the concept is its possible influence over the evaluative stage of learning. When performing different methodological strategies, it is crucial to evaluate them in different ways. There are various recent examples for these “alternative” evaluations [2,3]. As an example of other papers covering this topic, Munuera and Ruiz express that the use of these concepts related to game theory could “allow [one] to generate a motivating environment to knowledge, as you can instantly know the evaluation of the contents and [the] student´s level of assimilation of them” . Manipulation: In some gamification approaches, some ideas have clearly been put in place to influence students to choose specific paths, distorting students’ right to free will (i.e., the idea of providing better or worse badges depending on the chosen strategy within a gamified activity). Hedonic Treadmill Reinforcement: This idea poses a serious risk to more idealistic approaches to the gamification concept. There is a risk that, if individuals only act when there are rewards, they will reach a point where they might not continue playing if there are none. Based on this approach, it appears to be evident that it will be necessary to avoid using these gamification activities where the only goal is obtaining rewards, essentially because, by doing so, students might lose their motivation, the pleasure of obtaining a greater reward, or their will to fulfill a greater objective after obtaining these immediate gratifications. Overemphasis on Status: Our state or position with respect to others is a very motivating element, as we, as humans, carry out actions to improve our own status. However, if the system only focuses on these elements, it can lead to demotivation (i.e., knowing that we will never be able to reach the first position in a gamified activity). Even more pertinently, many people do not feel this need of being recognized. This is a common error in gamification, as teachers will not focus on status alone. Could learning be improved by using gamification strategies? If so, how will this be reflected in students’ performance? What is the cost of this learning? Can teachers take advantage of a new proposed evaluation method? The main objectives of this work are clearly linked with the three questions expressed above. Based on our teaching experience, there will be a methodological proposal to design educational rubrics to assess students’ experiences of the active methodologies in secondary education. By proposing this model, we intend to justify the advantages of gamification when it comes to motivating students and thus achieving an applicable and meaningful learning process for all parts involved. This paper will start with some common background related to the term “gamification,” to then continue with the proposed method. After presenting it, there will be a discussion where we will discuss the implications of a holistic evaluation for the students involved in the process, followed by the conclusions. Over the years, there have been many different attempts to define the term “gamification.” Although this paper will cover some of the most consistent attempts to define this idea, it has been hard to agree on a certain definition that will cover all of its complexity. Besides this, the term has been gaining momentum over the years, as more and more teachers and educational academics have been focusing on understanding and explaining how this specific term could be used to help to bridge the gap between a more conservative approach to education and the rise of active methodologies and its epistemological approach to teaching. Based on the information stated in Figure 1 and Figure 2 from Google Trends , the rise on the interest in the educational field began in September 2010 with the first significative result over 1 search per month. Since then, search results started to rise. This search result remains steady in an average of 75 searches per month, always descending during school vacation periods (Summer and Christmas). When a search term is compared with others from the same educational innovation field, such as project-based learning, the results are quite similar, even on their distribution throughout the year. Figure 1. Google search results for “gamification” (blue) since 2004 . Figure 2. Google search results for “gamification” (blue) vs. “project-based learning” (red) since 2004 . September 1980: Thomas W. Malone at Palo Alto Research Center wrote a slightly revised version of his Ph.D. dissertation submitted to the Department of Psychology at Stanford University. In his document What makes Things Fun to Learn? A Study of Intrinsically Motivating Computer Games , he defines various concepts related to game theory that later on will be used and recycled by other authors to define the term “gamification.” Even when Malone did not coin the term, he made all the theoretical work to ensure that a new innovative framework could be generated where motivation would be at the central spot for computer game’s users and game theorists. This work will be discussed in-depth throughout this article. Late 2002: Nick Pelling, an English Computer Engineer and Game Developer coins the term, initially with the goal of developing a new way of dealing with transactions and activities on commercial electronic devices. In Pelling’s own words, the goal was to “apply game-like accelerated user interface design to make electronic transactions both enjoyable and fast.” . Even though the coining of its definition did not boost users’ interest, this first definition was crucial for the later development of the discipline. March 2011: Two months before Sebastian Deterding, defined by some authors as “one of the most influential thought leaders in the area of gamification” , Zimmerman & Cunningham defined gamification as “the process of game-thinking and game mechanics to engage users and solve problems.” . It was a significant definition as it shows, for one of the first times in history, the relation between game-thinking and problem-solving. May 2011: One of the most relevant papers related to the actual definition of gamification was Deterding et al.’s From Game Design Elements to Gamefulness: Defining “Gamification,” which in May 2011 provided one of the most shared definitions of gamification, stating the term as “the use of game design elements in non-game contexts” , receiving broad support with 102 citations on June 16, 2013 . One of the reasons why Deterding´s paper became so influential is thanks to two specific factors: first because of the simplicity of his definition and second because of its good assessment of where to place the term in the game vs. play conceptual framework, where gamification is shown in a partially-related-to-gaming sphere of influence; furthermore, the author uses a very graphic explanation to describe its definition . This made Deterding et al.’s definition the most widespread definition still in use. August 2011: Finally, on this race to define (and own) the growing influence of this term, research and advisory American founded company Gartner defined gamification as one of the emerging technologies for their Hype Cycle in 2011 . This tool is meant to provide help to strategists and planners with an assessment of the maturity, business benefit, and future direction of some of the top technologies in the world . As can be seen in the next image, gamification is highlighted as one of the most interesting emerging technologies. Based on Dicheva et al., in 2013, the expectation for reaching the productivity plateau was five to ten years . This position, however, reflected mainly its use in business contexts. Penetration of the gamification trend in educational settings seemed still to be becoming increasingly substantial, as indicated by the amount and annual distribution of reviewed works. As exposed, and based on the evidence from past papers, some of the most relevant moments were in 2011, when three of the most relevant and influencing authors came together, boosting the expectancy related to the term and its academic and business use. The reason why, in this paper, focus will be put on Malone’s theories despite others with higher repercussion is simple. First, many other authors have tried to define gamification in different fields such as online software, idea competitions, citizen science, marketing, and many more [16,17,18,19,20], but most of these have focused on defining the concept from an economically driven point of view, as their proposals were deeply related to game design and user experiences in video games and computer science . However, the term has been gaining much more relevance in fields such as consumer marketing and computer user interfaces. This has led to a businessificationof the term “gamification,” leaving the term empty of its educational goal in many ways. Exactly when the term started becoming increasingly relevant in the educational field, gamification as a concept was increasingly used in fields with a growing economy and plausible investment implications. This has led to a situation where the concept often “feels” out of tune with its original game-theory-related meaning. It has become a floating signifier. Even in actual education, the term seems to be defined as a floating signifier, as it is sometimes being used to push economical goals under the educational innovation idea framework. This is not the case of Thomas W. Malone’s Ph.D. dissertation objectives. In his thesis, Malone’s goal is to find a game theory (and, of course, a model for that theory) that will allow games to be playful, desirable, motivational, fun to play, and enjoyable. The most relevant part of Malone’s thesis for this paper is how these ideas could fit into a more educational approach to the term. In fact, after reviewing the most significant contributions throughout history, the various reasons why this article will be focusing on Malone’s theoretical model are reinforced, especially from a modeling point of view. By proposing a methodology whose main goal is to design better educational rubrics (based on Malone’s game theory and theoretical models of game design) to assess students’ experiences of the active methodologies in secondary education, the final objective is to realize the gamification concept with a more didactical (and enjoyable) meaning and to help to apply these ideas in modern innovation in education. to make conceptual valuable enjoyment the central paradigm of the gamification ideal. In order to make sure that Malone’s ideas in What makes Things Fun to Learn? A Study of Intrinsically Motivating Computer Games  are used in a way that will help to build a new didactic paradigm related with evaluation rubrics, this article will present a conceptual map based on all of the ideas (and connections between them) that the author used in the revised version of this Ph.D. dissertation. After reviewing all main concepts, the most relevant concepts from Malone´s theory will be introduced to design an educational rubric that can be used to assess and evaluate any kind of active methodology experience for students in different educational environments. To clarify all concepts related to Malone’s theory, a conceptual map will be presented in order to increase understanding of Malone’s brilliant Ph.D. dissertation. 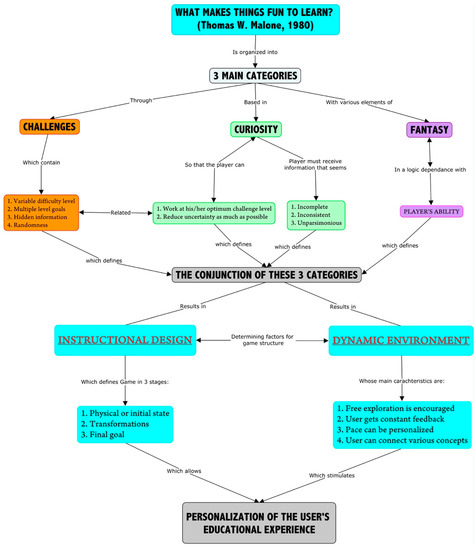 Based on Figure 3′s conceptual map, there are clearly five main concepts that appear constantly and repeatedly during Malone’s argumentation: challenge, curiosity, fantasy, design, and environment. Figure 3. Conceptual map of Thomas W. Malone’s Ph.D. dissertation (source: personal elaboration). These will be the five concepts that will be used to define the rubric. Of course, this will not be done by simply translating these concepts and/or copying them into it, as a didactic and educational filter must be applied prior to proceeding. In order to make this possible and to make it an appealing tool for any teacher interested in using it, it is crucial to define which definition of an educational rubric will be used in this paper. A rubric could be defined as “a scoring guide used to evaluate the quality of students’ constructed responses” . It is clearly an attempt to set expectations and to define an evaluation structure to advise the student in advance or during an assessment activity. In order for the teacher to do so, the rubric must contain at least two dimensions that will be used to judge students’ performance, each of them with definitions and/or examples that will clarify the scale of values that will be used to evaluate each dimension. Additionally, standards of excellence for specified and holistic performance levels will be included. The most typical example of the rubric has the shape of a grid. Once all definitions have been settled, the evaluation rubric based on Malone´s conceptual map can be defined. Taking into consideration all variables, there will be two dimensions: one based on all the different holistic criteria on which students will be evaluated and another where performance levels will be included. Q1 (bottom 25% of the total): This quartile will define the lowest performance level possible for a given variable. This quartile will be given to students that are substantially underperforming based on their capacity and the teacher’s evaluation. Q2 (bottom 50% of the total): This quartile will define the second lowest performance level possible for a given variable. This quartile will be given to students that are below performance. Students falling under this quartile will be evaluated as fulfilling the most basic objectives for a specific variable, always based on the individual student’s capacity and the teacher’s evaluation. Q3 (top 25% of the total): This quartile will define the second highest performance level possible for a given variable. This quartile will be given to students that perform satisfactorily or even slightly remarkably for a specific criterion. Q4 (100% of the total): This quartile will define the highest performance level possible for a given variable. This quartile will be given to students that have an outstanding performance. Ideally, your rubric will have three to five performance criteria. What are the learning outcomes of this activity? Which learning outcomes will be listed in the rubric? Which skills are essential at competent or proficiency levels for the task or assignment to be complete? How important is the overall completion of the task or project in comparison with other factors? how the group will react to the challenge from an achievement perspective, given the fact that students will know how they will be evaluated prior to starting the activity in the classroom. how original (without losing a sense of quality for the final content) the final “product” presented by the group of students is and how each of them has contributed to it from an individual perspective. Fantasy: The author differentiates deeply between intrinsic and extrinsic fantasy. He writes: “In an extrinsic fantasy, the fantasy depends on the user’s use of the skills but not vice versa. Most extrinsic fantasies depend on whether or not the skill is used correctly (i.e., whether the answer is right or wrong). (…) In intrinsic fantasies, on the other hand, not only does the fantasy depend on the skills, but the skill also depends on the fantasy. (…) In intrinsic fantasies, the event in the fantasy usually depends not just on whether the skill is used correctly, but on how its use is different from the correct use.” . Malone ends his dissertation recommending the use of intrinsic fantasies for games. how the activity’s requirements will affect student’s motivation. how many high quality standards (specified for each and every activity) students have been able to fulfill during the planning and presentation phase. All criteria have been defined for the evaluation rubric, so here we define it as follows on Table 1. Some common descriptive terms to indicate a progression from the Faculty Innovation Center at The University of Texas at Austin  have been used to model this rubric. Table 1. An example of a qualitative proposal for an individual evaluation rubric based on Malone’s corollaries (source: personal elaboration). In the example shown above, the theoretical student would achieve 80% in this activity; out of 20 possible points, he/she would achieved 16. Students must know before starting any activity on which aspects will they be evaluated and how this evaluation will affect the rest of their unit’s evaluations. By using this tool, teachers will be able to use game theory ideas to evaluate from a comprehensive point of view, all factors that will be taken into consideration when proposing, from a teacher’s point of view, any kind of activity related to gamification and other active methodologies. Based on the working hypothesis, and always taking into consideration the goal to assess a qualitative initiative from a theoretical perspective, the results of designing this rubric could provide a very well-structured answer to the debate of ensuring that a proper evaluation is performed when deciding to work with any kind of innovative methodology. It is necessary to highlight that, apart from proposing evaluation percentages for each of the rubric’s criteria, it is crucial that, based on the future results of this proposal, how the didactic unit percentages will reflect these activities’ weight in the total weight of the evaluation process can be evaluated. The evaluation process will be composed of several percentages for all of the classroom and homework’s activities proposed to the students—it will be a mix of rubrics and other evaluation materials or even a mix of different rubrics. Based on this idea, some authors have proposed in previous studies [25,26] various alternatives for the final share of this percentage sharing. Based on the idea embedded throughout this paper, defending the idea that the final evaluation of the student must be as holistic as possible and must entitle students to be positively evaluated if they can prove to be sufficiently prepared in different evaluation aspects such as exams, homework, classwork, and activities of active methodologies, the teacher´s evaluation method must include all of these different projects to ensure that proper objective evaluation is performed. 35% based on the rubric: Out of the 100% final grade for a specific unit, 35% will be based on the final grade obtained in the rubric. 35% based on exams: This percentage will include all questions on the partial exams (if applicable) and the final exam. These exams must include various different questions (test-type, explanatory, etc.) so that all possible “classic” didactic criteria will be assessed by answering these questions. 30% based on classroom performance and homework: All classroom and homework activities (taking notes, reviewing exercises, class participation, volunteering, etc.) must be considered in the evaluation and must be weighted equally with the rest of the activities that students will perform throughout the unit. The implications of this holistic approach will be considered in the broadest context possible, especially considering that 65% of the final evaluation of all the students will be based on their day-to-day classroom/home performance and their ability and knowledge expressed and evaluated through the rubric. Additionally, by proposing this “equally-weighted” evaluation for these three criteria, it is expected that all actors involved in the educational process will understand the message that teachers are sending: grading must be a matter of evaluating consistency instead of just giving value to remembering what you have been instructed to write down on the exam day. This way it could be ensured that, as an expected result, educational grading systems will start to reflect more accurately the real effort that students are putting into the learning process. It is clear that the proposed method can only be improved when measurements are applied to it. This is the reason why ideas such as achievement, originality, motivation, design, and quality must be evaluated in a structured way that will allow teachers and facilitators to improve them throughout the student’s school cycle. Students’ performance will be strongly affected by this new proposed method of evaluation, as up to 65% of their performance will depend on activities that will reflect their improvement on the above-mentioned concepts. This will allow students with a good attitude and a will to learn but with a bad performance in the “one opportunity” approach to perform better. Many of these students, for various reasons, might not perform well on the “100% exam” approach, but they might do better if 65% of their grades are based on a holistic approach. The most important factor to take into consideration when proposing these activities to teachers is to assure them that, by “moving” into this new proposal, their workload not only will not increase but will eventually be reduced. Thus, in this regard, the cost is very low. By using this approach with rubrics, teachers can reduce evaluation time, as they can evaluate while students are presenting their work. Teachers could even store these tools virtually in any kind of device, making the evaluation process much smoother and available in multiple platforms. This is the main reason why teachers will take advantage of these new proposals. The main conclusions of this work are aligned with student’s learning enjoyment, the idea of conceptual valuable enjoyment, and the creation of an interactive framework to achieve improvements in the teaching–learning process. As discussed throughout this article, gamification greatly enhances both cooperative and collaborative learning. Both the teacher and the student must change the role they play so that the student becomes the real protagonist of their own learning and the teacher plays a role of the facilitator of this process. By abandoning the traditional framework of the teacher being exclusively responsible for disseminating content to become a guide or reference, which is able to help the student to find its own way, teachers will help to develop a much more enjoyable and profound learning process for his/her students. In the same way, gamification processes must facilitate student’s interactivity with their peers, as in many situations they need to cooperate between them to find a solution to various proposed problems. This, at the same time, aligns very well with other relevant learning initiatives, such as problem-based learning and project-based learning, which opens a space of collaboration between heterogeneously interactive active methodologies. Humans enjoy learning in general and are able to learn while enjoying. The final main idea is to take advantage and recognize the potential for gamification to be implemented in a framework that allows, in many cases, to rethink the game. The theoretical and practical impact of this study could be best understood when taking into consideration the junction between these two transversal ideas and the four main research questions expressed and discussed throughout the paper. The implications of turning gamification theory into a practical tool (evaluation rubric) that could be used in many different evaluation activities could be diverse, especially thanks to its cross-cutting approach. It is expected that this impact will be better measured when implementing these tools in a real secondary class environment. This is the reason why, as a proposal for potential prospective studies, it would be very interesting to investigate how the use of gamification improves motivation in students from a practical point of view. Additionally, it would be significant to highlight the possibility of developing this rubric based not only on Malone´s corollaries but also on other interesting authors such as Deterding et al. . Furthermore, it could also be thought-provoking to propose other different frameworks that would put at teacher’s disposal more resources (i.e., visual and interactive models) that might better adapt to different learning styles. The next learning paradigm will be in connection with these ideas. Conceptualization: D.C.M. and J.J.R.G. ; formal analysis: D.C.M. ; investigation: D.C.M. ; methodology: D.C.M. and J.J.R.G. ; project administration: D.C.M. ; resources: J.J.R.G. ; supervision: J.J.R.G. ; validation: J.J.R.G. ; visualization: J.J.R.G. ; writing—original draft: D.C.M. and J.J.R.G. ; writing—review & editing: D.C.M. Gamificación en el cine: Jumanji. Available online: https://www.wonnova.com/blog/gamificacion-cine-jumanji-201402 (accessed on 28 January 2019). Calderón, Q.; Isabel, R. Diseño y Validación de una E-Rúbrica para la Evaluación de Competencias Clínicas Transversales de Bioética en Pediatría. Available online: http://dspace.casagrande.edu.ec:8080/handle/ucasagrande/1375 (accessed on 28 January 2019). Masmitjà, J.A. Rúbricas para la evaluación de competencias. Available online: https://www.researchgate.net/publication/299903426_Rubrica_para_la_... (accessed on 28 January 2019). Munuera Gómez, P.; Ruiz González, R. Gamificación, portafolio digital, contrato académico y rúbrica. estrategias para la adquisición de competencias. Available online: https://www.researchgate.net/publication/318827885_GAMIFICACION_POR...(accessed on 28 January 2019). Borrás Gené, O. Fundamentos de Gamificación. Monografía (Documentation). Rectorado (UPM), Madrid. Available online: http://oa.upm.es/35517/1/fundamentos%20de%20la%20gamificacion_v1_1.pdf (accessed on 28 January 2019). Google Trends. Available online: https://trends.google.com/trends/?geo=US(accessed on 28 January 2019). Malone, T. What Makes Things Fun to Learn? Heuristics for Designing Instructional Computer Games. Available online: https://hcs64.com/files/tm%20study%20144.pdf (accessed on 28 January 2019). Pelling, N. The (Short) Prehistory of ‘Gamification’ Funding Startups (& Other Impossibilities). Available online: https://nanodome.wordpress.com/2011/08/09/the-short-prehistory-of-g... (accessed on 28 January 2019). Németh, T. English Knight: Gamifying the EFL Classroom. (Unpublished Master’s Thesis), Pázmány Péter Katolikus Egyetem Bölcsészet- és Társadalomtudományi Kar, Piliscsaba, Hungary. Available online: https://ludus.hu/gamification/ (accessed on 28 January 2019). Deterding, S.; Dixon, D.; Khaled, R.; Nacke, L. From Game Design Elements to Gamefulness: Defining “Gamification”. Available online: http://www.rolandhubscher.org/courses/hf765/readings/Deterding_2011... (accessed on 28 January 2019). Deterding, S.; Dixon, D.; Khaled, R.; Nacke, L.E. Gamification: Toward a Definition. Available online: http://gamification-research.org/wp-content/uploads/2011/04/02-Dete... (accessed on 28 January 2019). Gamification Co. Gartner Adds Gamification to its Hype Cycle. Available online: http://www.gamification.co/2011/08/12/gartner-adds-gamification-to-... (accessed on 28 January 2019). Gartner. Newsroom. Available online: https://www.gartner.com/en/newsroom(accessed on 28 January 2019). Khan Academy. Available online: http://www.khanacademy.org (accessed on 28 January 2019). Witt, M. Gamification of Online Idea Competitions: Insights from an Explorative Case. Available online: https://www.researchgate.net/publication/267365902_Gamification_of_...(accessed on 28 January 2019). Hamari, J.; Koivisto, J.; Sarsa, H. Does Gamification Work? A Literature Review of Empirical Studies on Gamification. In Proceedings of 47th Hawaii International Conference on System Sciences,Waikoloa, HI, USA , 6–9 January 2014; IEEE Computer Society: Washington, DC, USA. Popham, W.J. What’s Wrong—and What’s Right—with Rubrics—Educational Leadership. Available online: http://www.ascd.org/publications/educational-leadership/oct97/vol55... (accessed on 28 January 2019). The University of Texas at Austin. What is a Rubric? Available online: https://facultyinnovate.utexas.edu/sites/default/files/build-rubric... (accessed on 28 January 2019). MIT Teaching and Learning Laboratory. Grading Rubrics. Available online: http://tll.mit.edu/help/grading-rubrics (accessed on 28 January 2019).